The work doesn't end just because it's cold and wet outside--that's where the Bogs Rancher Forge Steel Toe boots come in. This men's safety toe boot features 100% waterproof protection and warmth thanks to the hand-lasted natural rubber upper laid over a four-way stretch bootie made of flexible 7mm Neo-Tech insulation. Inside, your feet find superior cushioning for comfort when you're working those long hours, and the Aegis antimicrobial contoured insole offers an odor-free environment. The non-marking rubber outsole is slip and chemical resistant, and the steel toe meets many work standards. With a boot rated to -40°F, you'll be able to get work done even in sub zero conditions. The Bogs Rancher Forge Steel Toe provides the protection, comfort, and warmth required for all that Mother Nature can throw at you. *Please note this boot may be shipped with either the gray or yellow toe. *A $5 handling charge will be added to this over-size item when shipped via Standard Shipping. A handling cost will also be added if shipped via 2-Day Air. Please call for 2-Day Air Oversize Shipping Prices. I am in Waste Management, pumping septic tanks and grease traps. Was looking for a good boot other than Red Wings - which is a good boot, but when leather gets soaked in septic and/or grease . . . you get the picture. So I was looking for rubber boots. Found these Rancher Boots. Have always been pretty weary about ordering boots online - but these boots fit like a glove. Have warn them for two days and really enjoy them. Haven't had to "break them in," either. 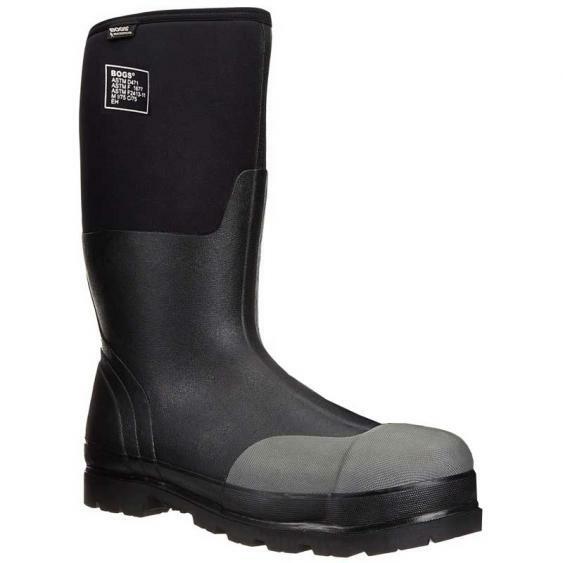 The Cadillac of rubber boots in my opinion. Definitely recommend these boots. Thanks. Bought these shoes searching for a warm snow boot that would stay dry. These are a gem, went sledding yesterday in 8" snow for 4 hours, and I couldn't be happier with them. And they're steel toe! Only thing is my toe is not yellow, it's grey, but no big deal.